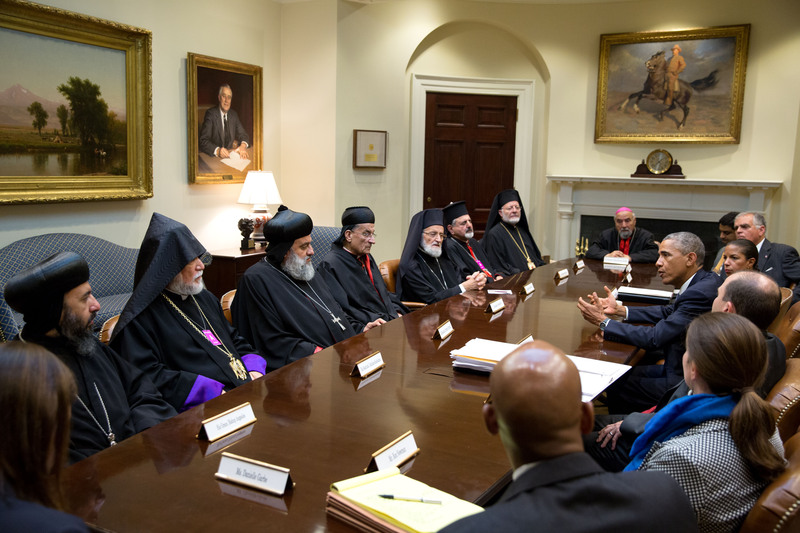 President Obama discusses the situations in Iraq and Syria with Christian religious leaders of the Middle East. By The White House. In looking at what the US – or anyone else – should do about ISIS, the first step should be to understand why it has made the gains it has. So far, it seems that ISIS’s gains have been partly about who ISIS is, partly about how ISIS uses relationships with other groups, and partly about success breeding success. ISIS is a transnational group, established by a Jordanian but bolstered by a core of savvy former Baathist military leaders who have found purpose in a conservative version of Islam. It aims to establish an Islamic caliphate in the Middle East. It is more territorially concrete and less specifically anti-American than al-Qaeda (for more on this, see some useful backgrounders here and here). It has a global recruiting strategy. It has both local and global strategies for gaining resources. And it has the organizational capacity to generate both violent and non-violent collective action. As Stathis Kalyvas has suggested, it surely makes sense to think of ISIS as a revolutionary actor more than an Islamic actor. But we also might usefully think of it as extreme case of what Clifford Bob calls the “global right wing.” These are groups who react to distasteful elements of globalization with conservative responses, including attempts to turn back the clock (in al-Baghdadi’s case, the aim is to turn back the clock hundreds of years). The global right wing often deploys exclusionary strategies and negative tactics. Sometimes they use violence. While attacking globalization, however, groups making up the global right wing often make significant use of globalization’s tools. Audrey Cronin wrote an article more than ten years ago arguing that extremist groups (often with religious claims and deadly capacities) were, paradoxically, using the very technologies undergirding globalization to attack it. Indeed, more than a decade ago, such movements were already exploiting information technology to coordinate attacks, recruit attackers, communicate with the like-minded, and attract adherents. ISIS has proved masterful at this, developing sophisticated recruitment videos aimed differently at recruits in the West compared with recruits from the Middle East. For the western audience, ISIS’s recruitment videos promise self-fulfillment and purpose; they talk about jihad as a cure for the depression inherent in the empty way of living within the West. 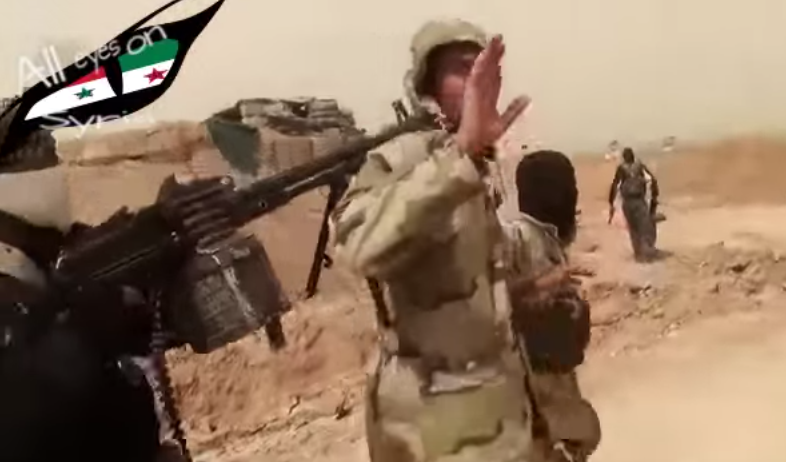 These videos actually downplay the violence entailed in ISIS’s mission. For the greater Middle East audience, recruitment videos emphasize duty for all Muslims, while highlighting violence and rightful vengeance against the corrupt and abusive regimes of the region. Recruitment strategies have even targeted women, promising them devout jihadi husbands and a chance to live in a true Islamic state. Thus far, some estimate that it has as many as 12,000 foreign fighters from 81 countries—2,000 of them from Europe and over 100 from the US. Jordan has the highest per capita recruitment, comprising a majority of the reported membership. These recruitment efforts are no doubt aided by a global economy where many young people have little to hope for, and the purpose of global stability increasingly appears tied to crass capitalism gone awry. ISIS doesn’t just recruit fighters with social media. It tweets, it posts, it blogs, it uses on-line services like JustPost and others, and it makes documentaries. All of these techniques aim not only to win potential adherents, but also to strike fear into broader communities and to communicate its power. By executing American journalists and Lebanese soldiers, ISIS paints itself as an unstoppable power. Perhaps more importantly, it portrays itself as the Islamic voice in global politics, even as it targets other Muslims. The group has used transnational markets to its advantage in resources – with not only oil and bank robberies but also with looted antiquities, which they have sold on global black markets. Beyond these windfalls, they have implemented a variety of local taxes and funds from Gulf States. Their multi-faceted resource strategy includes extortion, kidnapping, robberies, and smuggling. Although the organization is highly committed to Islam, offering those in its territory the chance to convert or die, it also seems quite pragmatic when in need of resources (e.g. offering escape from religious persecution for a price). Even using these sophisticated global tools, ISIS would not have had the success it had without its clever operations vis-à-vis other local groups. In Syria, ISIS has allowed other rebel groups to bear the brunt of fighting Assad, seizing their territory afterward. It has held increasing swaths of territory in Syria through violence, and it has maintained control over these spaces by creating relative order in the midst of an otherwise anarchic civil war. In Iraq, ISIS has clearly taken advantage of widespread Sunni disaffection with the corrupt Maliki government. Though the deal that gained Maliki power promised some prominent positions to Sunni leaders, Maliki never followed through on these promises. The perception that the Baghdad government was a seat of Shia cronyism created ample space for former Baathist members of ISIS to convince its Sunni brethren around Mosul to join forces. In a sense, ISIS has created its own “Sunni awakening.” Its dramatic success in Iraq was eerily reflective of the “successful” US surge. In its ability to create some order in the chaos of the Syrian war and its dramatic gains in Iraq earlier in the summer, ISIS has demonstrated capacity and organizational acumen. ISIS, more than other extremist groups, looks like it is accomplishing its goals. Widespread communication of its successes is a keystone of its public relations strategy, which draws in adherents by signaling that it is a winning horse worth backing. Any strategy to undermine ISIS needs to focus on all three of these elements—ISIS as part of the global right wing, its relations with other groups, and the important of tactical successes to its overall narrative. As such, the US strategy unveiled by Obama is wise to focus first on eroding the seeming inevitability of ISIS’s victory. This began earlier in the summer with the rescue of the Yazidis and support for the Kurds in airstrikes, followed by air surveillance in Syria. Demonstrating that the ISIS train can be stopped is an important first step. Chipping away at ISIS’s allies in Iraq is the second obvious step. Here the US and others could take advantage of a potential opening. While the ISIS governance strategy worked better against total anarchy in parts of Syria, it has been less well received in parts of Iraq. Last week the BBC reported that some Sunni tribal leaders have reportedly begun to rethink their interest in the alliance given the extreme nature of ISIS’s demands and ISIS’s refusal to allow much local autonomy in its newly captured territory. The outline of the US plan focuses on training and equipping the Iraqi army (now that it has a more inclusive Iraqi government). This may potentially include training and arming the Kurds and possibly members of Sunni tribes. The devil will be in the details here. It makes sense to support already strong authority in the region. This will encourage groups leaning against ISIS to stand up to it. But the US’s track record of managing “state-building” efforts while simultaneously engaging with more local forces in Iraq (and Afghanistan) is not particularly good. And the plans for the thornier question about how to combat ISIS in Syria are both less clear and less promising. The US has done better at managing crises to roll back attacks in the Middle East. It has not been as successful translating these short-run gains into positive steps toward inclusive governance. Furthermore, US anointment in Iraq and Afghanistan has led to leaders with little legitimacy and little attention to US concerns. The last thing the US wants to do is to intervene in a way that pushes the various anti-government rebels in Iraq (and/or Syria) together with ISIS against perceived US puppets. Though less may not be enough, I agree with Joshua Rovner that less is more when it comes to US presence in the Middle East. A broad strategy involving many others is a good idea. Doing that under the mantle of an American coalition is not. A plan with the US in a supporting, background role has best chance for long run success. Beyond that, however, what will the US and its allies do about the malaise upon which al-Baghdadi and others have been able to capitalize? Why have so many Jordanians signed up? What is it a reaction to? How do people see global society and its impact on their localities? Do they see dysfunction and corruption? Increasing inequality? Immorality? Lack of purpose? Where is the mobilization for a positive, alternative vision of inclusive local politics within a stable global society? 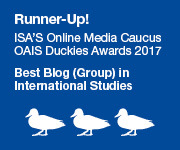 Messages about global citizenship, human security, and an inclusive global politics seemed to evince more hope in the 1990s – perhaps for good reason. The shreds of a hopeful message visible in parts of the Arab Spring have blown into hiding. 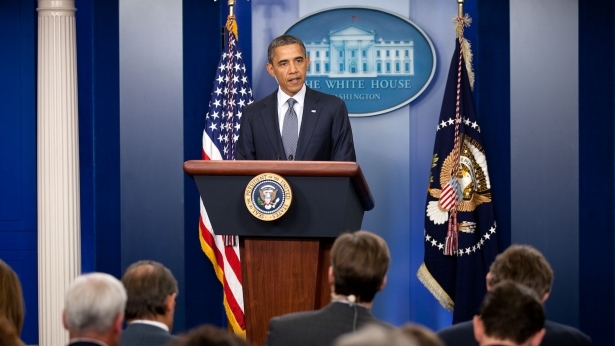 The US talks more about how to combat extremism than about what might replace it. Though some audiences in the US believe that America holds the keys to the future, many across the world do not. Instead of such an exclusive focus on military strategies and rhetoric about the benefits of living in America, the US needs to think of its broader political strategy. Whether the current strategy toward ISIS leads to a more peaceful and inclusive Middle East will ultimately rest on attention to establishing an inclusive local and global society and, even more importantly, developing capable nonviolent strategies for achieving it. Deborah Avant is a Professor at the University of Denver’s Josef Korbel School of International Studies and the Director of the Sié Chéou-Kang Center for International Security and Diplomacy. A good essay, but I think the very first step in dealing with the Islamic State is figuring out what actually needs to be done. For those who want to do this, be they great leaders, holy men, or just us lowly peons, that means less propaganda, less self-promotion, less sanctimony, fewer fantasies, and more use of actual facts and reason. Unaccustomed as we may be. We all also might be a bit more open about our aims, for instance, we need to know if the American leadership is still scheming to get the Russians kicked out of Tartus by getting Assad kicked out of Damascus. Weakening Assad is how we got the Islamic State in the first place. But I guess now I’m the one indulging in hopeless fantasy. I disagree, US will open the gates of hell by attacking ISIS and leaving Assad, ignoring the social factor here will worsen things as people will consider US a greater enemy for supporting tyrants killing their people in the ME. Today, Russians and Americans are both imperialist decaying powers, they are just fighting on territories, and I believe US has no problem to sell my country Syria to the Russians and Iranians as long as this might fulfills other more important interests. Hence, everyone is talking about us like we are cattle, our opinions and souls don’t matter.